A Thai officer checks a clock to commence voting at a polling station in Bangkok, Thailand, March 24, 2019. Thailand's first general election since the military seized power in a 2014 coup has begun. 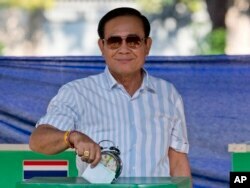 Thailand's Prime Minister Prayuth Chan-ocha casts his vote at a polling station in Bangkok, Thailand, March 24, 2019, during the nation's first general election since the military seized power in a 2014 coup. Thanathorn Juangroongruangkit, leader of Future Forward Party, poses as he casts his vote during general election at a polling station in Bangkok, March 24, 2019. The Asian Network For Free Elections has warned of “inconsistencies and irregularities” in the lead-up to the poll.